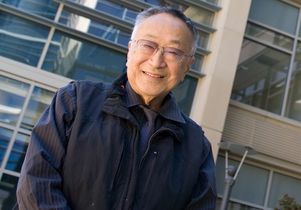 Paul Terasaki, in 2010, in front of the Terasaki Life Sciences Building, which was funded by his generous donation. 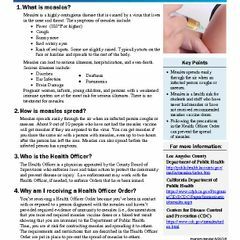 Terasaki, professor emeritus of surgery at the David Geffen School of Medicine at UCLA, developed the test that became the international standard method for tissue typing. The procedure, which assesses the compatibility of organ donors and recipients, has been used for all kidney, heart, liver, pancreas, lung and bone marrow donors and recipients for the past 40 years. In 1984, he founded One Lambda with eight of his former students; the company, which he sold in 2012, now has more than 270 employees and continues to play a central role in the advancement of tissue typing. “The campus mourns the passing of one of UCLA’s most accomplished scientists and most generous benefactors,” UCLA Chancellor Gene Block said. “Paul brought great prestige to our university as a distinguished member of our faculty and through his legendary accomplishments in transplant medicine. Beginning with a $10 gift in 1972, Terasaki donated more than $58 million to UCLA over the past four decades plus, including $50 million toward the state-of-the-art Terasaki Life Sciences Building and an endowed chair in surgery at the Geffen School, and a total of more than $6 million to the UCLA International Institute which, among other things, established the Paul I. and Hisako Terasaki Center for Japanese Studies and endowed faculty chairs in that discipline and in U.S.–Japanese relations. Highly active within the Japanese–American community, Terasaki was involved with the Japanese American National Museum, the Japanese American Cultural and Community Center, and the U.S.–Japan Council. He also sponsored several students’ educational trips to Japan. 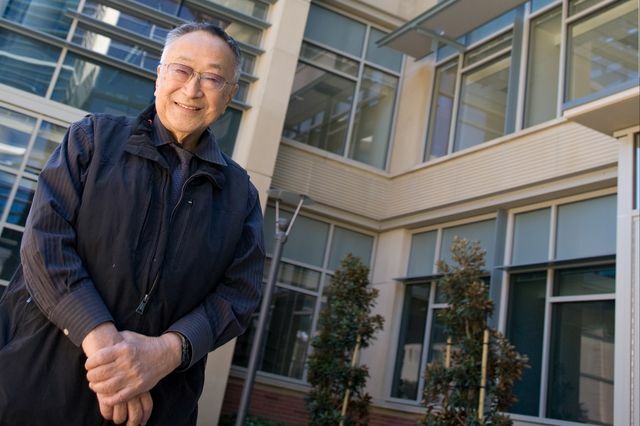 Terasaki was asked in 2010 whether he could have imagined during his childhood that he would one day be in a position to donate millions of dollars and to have a university building named for him. 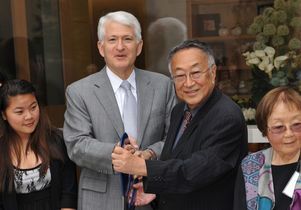 Terasaki was awarded the UCLA Medal, the campus’s highest honor, in 2012. Terasaki was born into a poor immigrant family in the Boyle Heights neighborhood of Los Angeles in September 1929. His parents’ primary goal, Terasaki said in a 2010 interview, was to earn a living and educate their children. In 1941, his father opened a cake shop in Little Tokyo that was very successful. But during World War II, he was forced to sell the shop at a tremendous loss, and the family lost most of its possessions and was forced to relocate to an internment camp under federal orders. After the war, the family was uncomfortable with the idea of moving back to California and relocated instead to Chicago’s South Side. From age 16 on, Terasaki worked constantly. During his senior year of high school, he took 10- and 12-hour shifts on Saturdays and Sundays as a restaurant busboy, earning 40 cents an hour plus tips. He proudly gave the money to his mother, who kept his paycheck and gave him an allowance until he got married. When he graduated from high school, Terasaki thought of attending radio repair school. However, following his mother’s wishes, he entered the University of Illinois at Navy Pier as a pre-med student. When the family felt it was safe to move back to Los Angeles, Terasaki applied to UCLA and was admitted as a transfer student in 1948, at age 19. In Los Angeles, Terasaki’s father worked at an antique repair shop and his mother in garment factories. When his father became an apartment manager, Terasaki was the handyman, repairing toilets and painting the rooms. Terasaki began his work on transplant medicine in 1950 with his master’s thesis. In the early 1950s, Terasaki got his first car, a 1939 Plymouth whose clutch was always breaking. He drove it without a floor, which made it easier for him to repair. However, he could see the road when driving, which embarrassed him when he went out with his future wife, Hisako; he recalled that she did not complain about it. They married in January 1954. After being promoted from researcher, Terasaki served as a UCLA professor of surgery from 1969 until 1999, when he retired. Within a year, he resumed his academic pursuits with the creation of the Terasaki Foundation Laboratory, a research center dedicated to studying and solving the problem of organ transplant rejection and failure. He published more than 900 scientific articles and trained some 100 postdoctoral scholars at UCLA. His children have spent a total of 22 years at UCLA. His first son, Mark, earned a bachelor’s degree from UCLA (and a doctorate from UC Berkeley); his second son, Keith, earned bachelor’s and medical degrees from UCLA; and his daughter Emiko earned bachelor’s and master’s degrees from UCLA (and a medical degree from Brown University). Terasaki’s third son, Taiji, earned bachelor’s and master’s degrees at UC Irvine. He is survived by Hisako; their four children; six grandchildren, Mayumi, Paul, Kazuo, Susie, Kenta and Miya; and his brother, Richard. A memorial service is scheduled for 11 a.m., Sunday, March 6, at UCLA’s Royce Hall.